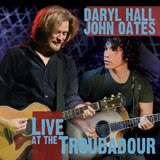 As Daryl Hall opens the Hall and Oates performance at the Troubadour, he reminisces about the last time the duo played the L.A. club--35 years ago when they opened for Harry Chapin. "This is the first place we ever played in Los Angeles...and nothing has changed in here, man!" The May 2008 performance was captured Blaze TV with 10 remote-controlled HD cameras creating audio and visuals that allows the viewer to experience the performance as if they were inside the crowded LA club. The result was released in three formats – DVD, Blu-Ray, and a 1-DVD/2-CD combo, via Shout! Factory on November 25th. Since it was recorded in May, sadly there's no rendition of Jingle Bell Rock, but the recordings would be a great holiday gift for any Hall and Oates fan.